Obtaining accurate antenna positions are important in VLBI system, especially for high precision astrometry. Mizusawa antenna has been participating in international geodesy observations at S/X frequency bands and all VERA stations are measuring their relative positions by K-band geodetic VLBI observations internally. 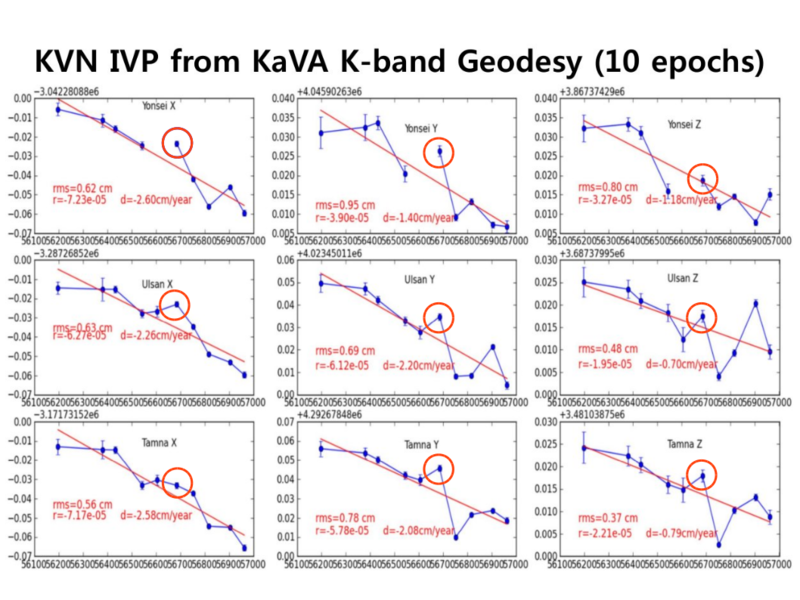 In order to determine and maintain accurate positions of three KVN antennas, KVN and VERA started the K-band geodesy VLBI program since 2011. Up to date, we succesffully obtained geodetic solutions of KVN antennas at ten epochs and their results are shown in the figure below. KVN antenna positions are shown in geocentric coordinates in three-dimensions along the Cartesian X, Y, Z axes (unit: meter) from left to right colums, respectively. Each antenna is presented from top to bottom rows. "rms" is the standard deviation of position changes from the linear regression and its coefficient is described as "r". "d" is the antenna position variation per year each. The abscissa represents the modified Julian Date (MJD). Current KVN antenna positions is marked with red circles with solutions obtained on Janunary 28, 2014.